Andrew is wholly devoted to continue the work of Peter Aston and the consort in its specialist performance of Early Consort music and music for voices. It is his desire to maintain the legacy that Peter left behind and shares the same love of the music of that genre. The consort aims to bring to life the music of the past that was written exclusively for voices, as well as performing new works and commissions. We are dedicated to the music that is put in front of us and ambitious about performing that music to the highest standards possible. Andrew began his musical life as a classically trained percussionist and pianist. He went on to read Music at the UEA graduating in 2011. He studied contemporary percussion, singing and conducting, to complement an inclusive course of study. Andrew still enjoys performing Oratorio works as a Bass soloist, as a percussionist for orchestras, and is particularly fond of English folk music and music from the Choral repertory. In 2011-12 he held a scholarship at Norwich Cathedral as a Bass Choral Scholar and enjoyed singing for daily services, recording with BBC Radio 3 and touring to France with the Girls Choir. Andrew has performed with choirs in some of the most prestigious venues in the UK and toured to Europe. 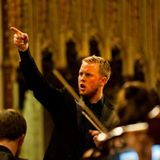 He is in demand as a bass soloist, particularly in Norfolk; his most recent solo appearance was with the Mid Norfolk Singers for a performance of Handel’s Messiah, and with Sheringham & Cromer Choral Society in Mozart’s Requiem and Bach’s Cantata BWV 140 Wachet auf, ruft uns die Stimme, ‘Sleepers Wake.’ He has studied with Andrew Yeats, David Lowe and currently studies with Ben Johnson. Andrew is an ardent supporter of music education and outreach. He has orchestrated drumming workshops and taken part in multiple theatre productions for children. He currently teaches music at Norwich School and is pastoral tutor to the Choristers. Andrew recently worked with English Touring Opera on the 'Turtle Song' project, in partnership with Turtle Key Arts, ETO, and the Royal College of Music with support from the Alzheimer's Society. He appears on a CD with folk-band Inlay on their self-titled album (2012) as an accordion player, singer and percussionist and has performed across the UK with the collaborative group. Composing and conducting excites Andrew's sensibilities as a multifaceted musician - he enjoys arranging and writing whenever he can.